I enjoy to observe and capture my impressions. Most of the time that’s enough. Sometimes, however, I long to know more. What’s the story of that person I couldn’t get my eyes off? What is that place that has intrigued me? Sometimes I catch a fragment of a conversation and I am happy to let my mind play with it. Never had I dared to become more active and approach someone directly to ask about themselves or their environment. Prompted by an assignment I strolled through the Sunset – a San Francisco district. As I was peeking through the shopping window of a slightly dated premiss, John Wentzel, the owner of this shop for antique radios and TV sets invited me in to take a look at his treasures. And he encouraged questions. I was taken by surprise and asked him about his life as I scribbled down (visual) notes. What marvelous stories he shared! But how to digest that experience ? The demographic of the Sunset has started to shift in the 1960s from Irish/German to a population of largely Asian descent. 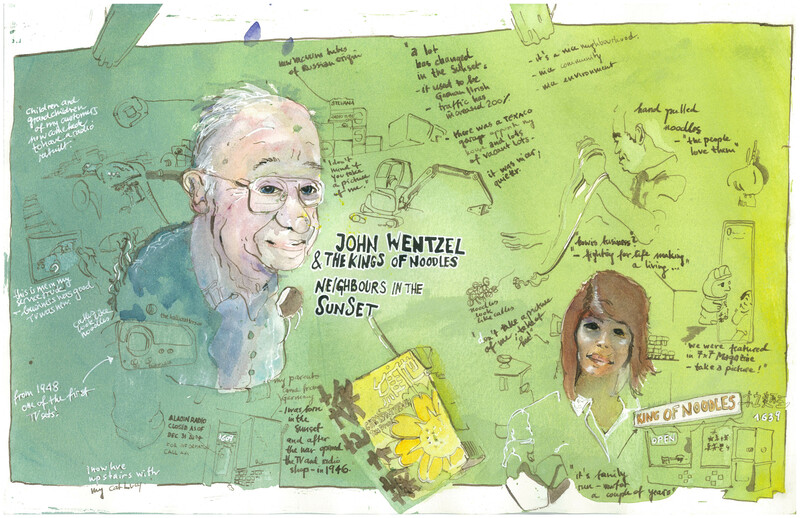 Inspired by my chat, I decided to capture my feel of the Sunset by juxtaposing the stories of two neighbouring businesses: John Wentzel’s and the Kings of Noddles’. Let me know how you like the visual reportage! It’s a first but I am considering doing more of that sort. If there are any places, topics or people you find interesting – let me know. Or volunteer your story! I LOVE this idea. I saw some maps that a book store on Mission were giving away free last year. They had illustrations of all the different areas and the ethnicity and history of the area. They were great. I love the idea of your conversations and stories being recorded in this way. Great to know also that you are still out there, wandering..flaneuring and being creative. I think I have seen the maps you are talking about. Good stuff! Thanks for your compliment and keep up the flaneuring :-).